As I get older I do less, but I notice and wonder more. When Kat and I worked in New Orleans we lived on the north side of Pontchartrain, crossing that lake once a week. We often rode a lovely bike trail known as the Tammany Trace following the lake’s northern coastline. One autumn day we saw Monarch butterflies, hundreds of them, flying not south, but west. They have learned to use man-made structures such as highways and bridges to make their trip safer. These west-bound butterflies were headed toward the 24 mile Causeway to cross that huge lake. Need to rest? Then light somewhere off the highway along the bridge. Need a nice updraft to help you soar? The heat of the concrete and the motion of southbound vehicles create an updraft and a mini-wind going in the perfect direction: south. North-bound humans rarely see Monarchs over the Causeway, but they’re everywhere on the south-bound span in October. 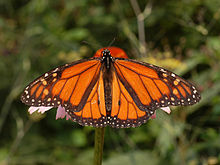 Monarchs migrate from Canada and New England to a sixty square mile wintering site in the mountains of Mexico. They’ve never been there before, nor have their parents, grandparents, and great-grandparents who all made their migrations going north. But somehow every fourth generation navigates the 3,000 mile flight. Science has narrowed their homing skills down to some combination of magnetic fields, stars in the night skies, and the angle of the sun. These butterflies hatch in August, became capable of flight in early September, and two months later find 100,000,000 cousins and a few siblings clustered in oak groves at 10,000 feet. The local people, the Mazahuas, have lived in those for mountains for hundreds of years. They view the butterflies as the spirits of their ancestors. 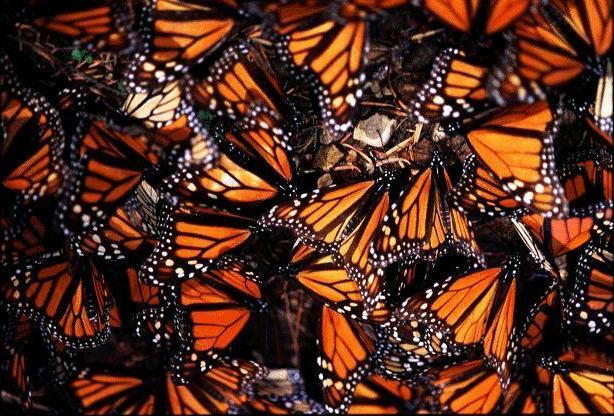 The arrival of the Monarchs, typically en masse, triggers a celebration known as The Day of the Dead. It takes four generations of Monarchs to complete the round trip. 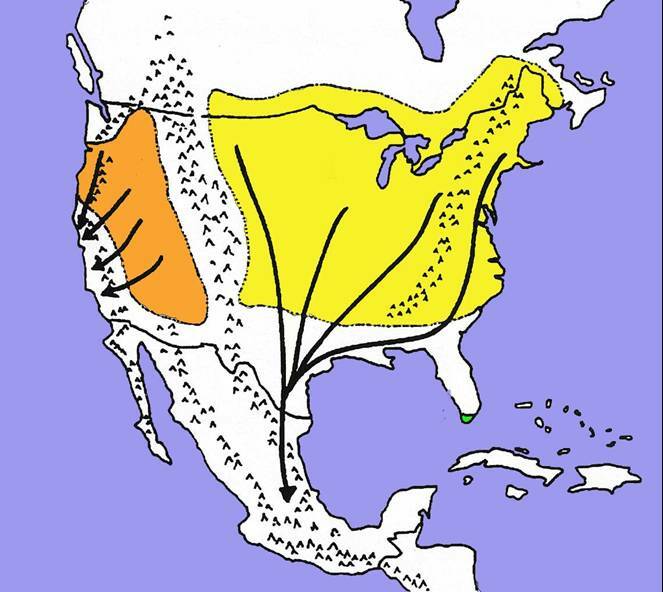 This fall’s southbound generation will winter in Mexico, then mate, lay eggs, and die in late spring. 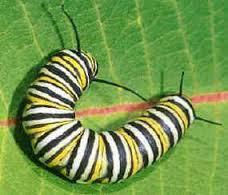 Their eggs become adult butterflies and migrate north to the Gulf States. One month later their life cycle is complete as they mate and die. The next generation survives but a single month after migrating to northern USA. The next generation also lasts one month, laying their eggs in Canada and far north New England. Next year’s magical fourth generation lasts nine months including their six week flight south and a long winter’s rest. The Monarchs’ long-term prospects are not good. Various species of milkweed are their favored food, but modern agriculture and suburban civilization wage relentless war on all weeds. Illegal logging in Mexico is rapidly clearing away their winter habitat, and the biggest trees (which hold the most heat over cold nights) are the best for Monarchs. How many butterflies are needed for a successful migration is an open question. Oh, I so love Monarchs. And you’re very correct about their long-term prospects. Here’s a site offering free milkweed seeds, information, and support: http://www.livemonarch.com/free-milkweed-seeds.htm. I used to be so delighted to see a few monarchs fluttering among our butterfly bushes in North Carolina Septembers; I can hardly imagine seeing them en masse. I hope that will be a possibility in the future if their diet habitat is not wiped out. Thank you for drawing attention to these beautiful and important insects! I don’t live anywhere anymore. That was my first thought. Then it struck me: we camp in a lot of protected places that don’t mow. If I were to carefully seed here and there along their flyway, it might make a difference for a few hundred, and if the seeds do well, several thousand. Yes, you never know — that could help, Jackson! We don’t live anywhere anymore either, but I try to publicize the plight of the monarchs whenever I can in case someone who does have a yard might take up the cause. I figured you might have a reader or two who still has a sticks and bricks home, thus the links I included. 🙂 I post this kind of stuff on Facebook from time to time too to encourage my homebound friends to think about the Monarchs! I just had to comment again, and here’s why. As we drove from Oklahoma City to Little Rock yesterday, we saw quite a lot of Monarchs flying across I-40 heading southwest. The numbers weren’t huge at any one time, but if you added up all we saw (two here, three there, two more here), it certainly represents a fairly large migration. So interesting and something I’ve never actually seen before. Today as we rode bikes down the Arkansas River Trail, we saw a few more. Both days, they’ve been fighting a vicious west wind. It was hard enough to cycle into; I can’t imagine how difficult it is for them to fly against! It was a real pleasure to see so many of these beautiful creatures making their way to Mexico. They do seem to follow our roads. Then again, maybe our roads follow old buffalo trails. Perhaps the Monarchs used buffalo roads before human roads. Traveling has helped us see how the planet is an integrated eco system in so many ways. Seeding as you go is a fantastic idea. Eons ago, on a fall visit to the NJ shore, I saw a spectacular Monarch migration. The bushes lining the road by the ocean were alive with them for as far as the eye could see. Thanks to Emily, too, for the links. I’ve never seen them roosting, but it must be a thrilling sight!